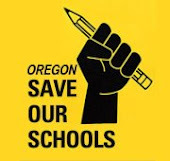 Oregon SOS member, Joanne Yatvin just published a fantastic piece in the Washington Post that gives us pause as it looks back to 1986. At the time, Joanne reviewed a book called McDonogh 15, 15, Becoming A School. In looking over her review, Joanne realized just what we can learn from our past. Since we are on a cusp of reclaiming our public schools from the corporate education reform movement, it is important to read Joanne's words from the past and use them to help guide our decision making for the future. Specifically, a good school mirrors the realities of life in an ordered, adult society; it is rational and safe, a practice ground for the things people do in the outside world. The school creates a sense of community that permits personal expression within a framework of social responsibility. It focuses on learnings that grow through use--with or without more schooling--such as communication skills, decision making, craftsmanship, and group interaction. It makes children think of themselves as people who find strength, nourishment, and joy in learning." Read more about Good Schools vs. Effective Schools here. This was written by Joanne Yatvin, a longtime public school educator,author and past president of the National Council of Teachers of English. She teaches part-time at Portland State University and is writing a book on good teaching in high poverty schools. This article, "Race to the Top Leave Schools Behind," just came out after the last blog post. It expresses the hidden costs of Race to the Top parameters such as having to adopt and implement the Common Core State Standards and assessments a well as implement a new teacher evaluation system. "The new evaluation system has proved to be one of the most divisive issues in the state. Districts are having difficulty working out the details through collective bargaining, as required by state law....From the start, there was little talk about the costs facing school districts trying to create a complex new evaluation system on the fly, said Jere Hochman, superintendent of Bedford schools, who serves on a state task force that tried to figure out how to make the whole thing work. The new evaluations must include extensive observations of teachers in classrooms, which requires training, preparation, written critiques, follow-up plans and more. Districts also must develop an appeals process for teachers who disapprove of their ratings — which could lead to high legal costs." Hopefully Oregon will think about these issues before jumping forward on their NCLB waiver plan. Oregon has little room for financial error as our classrooms are already being short changed in these trying economic times. We must demand an analysis and report on the potential costs of the waiver plan. It may not be worth going for right now. Unfortunately, the federal government has the state over a barrel as the 100 percent target is coming up in 2014 and states are scrambling to bypass this with the waiver so they aren't labeled failing. As mentioned in yesterday's post, some states are saying no to the waivers, but they still need to figure out something by 2014. A lot can happen in two years, and Oregon should take the time to problem solve it without rushing to sign on the dotted line.